I haven’t been on a skin binge in a long while (since Gala Phoenix put out those skins at the skin fair some time back that were all over the feed for months) and I guess it was just waiting to catch up with me. 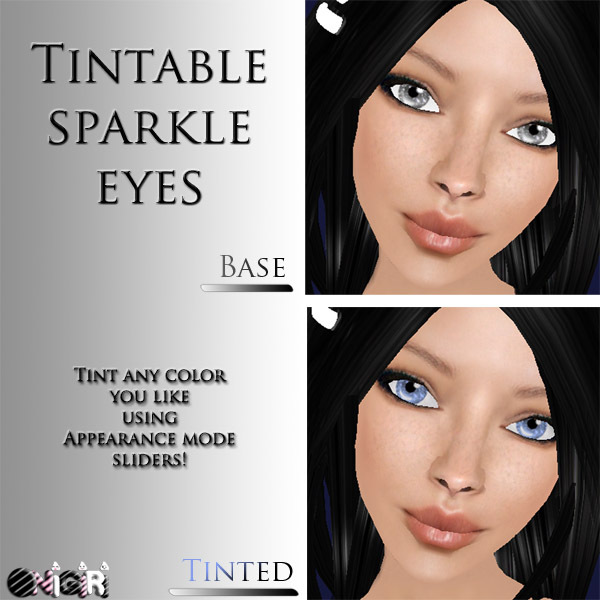 While I find myself falling in love with one skin after the next for the cute-yet-refined faces people have been coming up with, I find myself noticing that, once again, tan is back in style in SL. More and more designers are leaving their fair-skinned friends in the lurch and making many shades of tan, tan, more tan, or really tan. Is it because summer is coming? It isn’t that I don’t like tan skin, although I’m more of a fan of pale skin with a smattering of cute little freckles myself (maybe a trace of narcissism since it’s how I look in real life.) I’d just like the choice. I’ve even “settled” for some of the darker tones (calling themselves “fair” or even *gasp* “pale” – harking back to the days where Naughty skins seemed to reign the feed) but I have a major problem: I’m a big, big hair whore and the vast majority of my hair is pale blonde. What isn’t pale blonde is pitch black. Neither of these look good on the tones of tan skin that are so popular in SL, unless I’m going for the “hey look, it’s Malibu Barb…uh, did she get a spray-on tan? No blonde is THAT dark.” look. Please, oh pretty please skin designers – have mercy on us the melanin-challenged and offer us some lighter tones? ^_^ I know that, like I said above, some people have tried to offer what they consider “fair” or “pale”, but I’ve spent quite a bit of time in the Arizona sun already this spring and my skin doesn’t touch these “fair” skins :( My best suggestion would be trying out your lightest skin tone with platinum blondes from a variety of hair shops (most of mine are Magika’s platinum blondes before their blondes went dark and desaturated, but even ETD’s are sufficiently light for this test); if you look like you’ve spent too long in a tanning booth, try a little lighter! As designers, we are all, nearly without exception, committed to providing the best experience we can for our customers. We listen to their comments, complaints, praise, and suggestions, and work them in as best we can. We build our stores with the thoughts in mind: If I teleported into this place looking for X, would I be able to easily find it? Is the store ugly? Is it too laggy? among many other questions. We try to be available, answer every IM and notecard, and greet customers as time allows. Some of us even have customer service staff – something I am now contemplating myself. Some designers spend so many hours helping customers that they begin to feel as though they don’t have enough time to work on new releases. This is all great, of course. But I feel like I go a long time with nothing but crickets chirping in the feedback department, even when I ask for it. Sometimes I will send out a request for feedback about a new product, some people bite, and I don’t hear back from them. Sometimes I’ll send out the product to the group in general and ask what they think of it – and again, hear nothing. I’ve had my new main location up for a year and haven’t heard a single peep about it, good or bad. It’ s driving me a little batty, especially the lack of reponse when I offer a product to someone who said they’d tell me what they think (and I don’t mean bloggers, but for example, if I ask the store group or a social group or even a friend) and they either simply say “looks good” or the dreaded nothing at all. Then I’m sitting there thinking, eek, is it so bad they don’t want to lie and say it’s good but they can’t begin to tell me how much they hate it? Was it simply not their thing? Without standing in the store being annoying and asking customers random questions sounding like I’m taking surveys, how can I grab people’s attention and find out what they think and where I can improve? Has anyone had any luck in this department? A few months ago, I got it in my head that what Onigiri really needed was to script the wings. 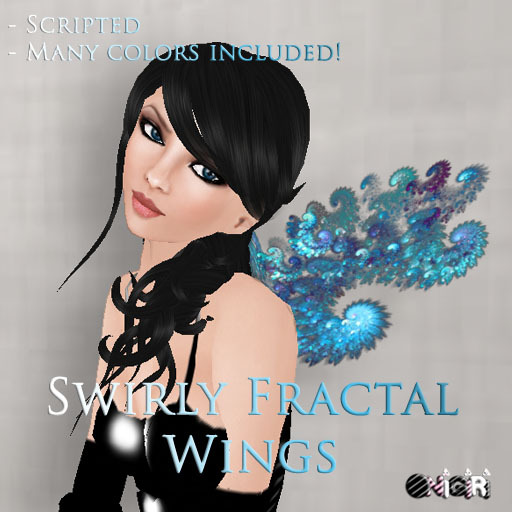 I LOVE making wings, but they just didn’t shine when compared to the ones that fluttered and all of that other stuff. I tried it on my own for about an hour before I was tearing my hair out :D So I went to Thom, my genius coder (and husband, as he reminds me), and told him that what I really want for my birthday is for my wings to flutter and resize. Those were the only specifications I gave him… but he went absolutely all-out. I built a HUD and he made it work, and now just a few days before my birthday, Onigiri has the scripted wings of my dreams! Not only do they flutter and resize, they can glitter, glow, change colors, and all kinds of other crazy stuff to make any control freak salivate. Basically, if you could do it with Edit mode, you can do it with the HUD and be assured you won’t mess up the wings. I love it. I’m so happy! 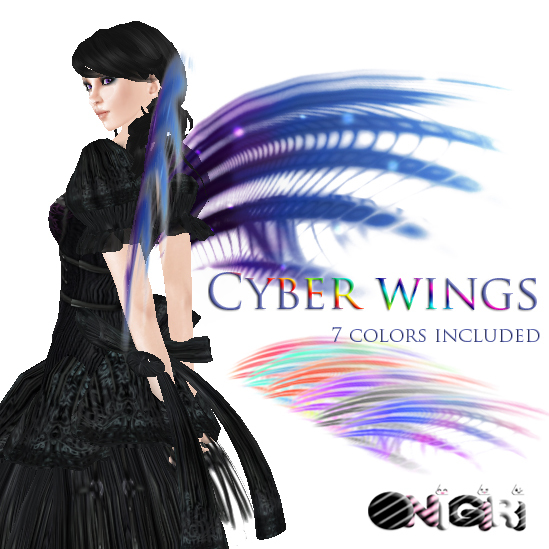 Here are some pictures of me goofing with the HUD wearing the cyber wings. 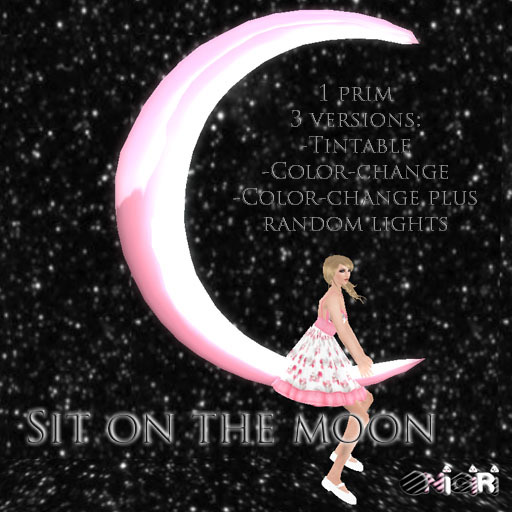 As I was updating some of the decor in the store, I also made a new moon, sculpted, with the pose built in to save prims. I decided to share it as well. Obsessively observant people will note that I had a set of these wings in the front window of Onigiri for the past … year, or so. I just finally got around to giving them some color options and a little TLC. I’m finally satisfied with them, so they’re up in the store now. 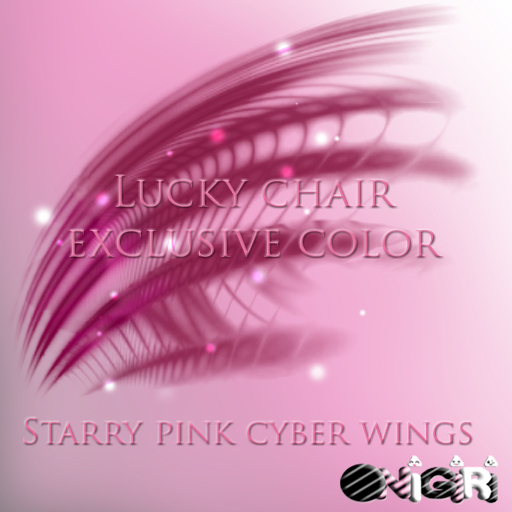 I have also added a lucky chair-only pink starry version. I’m not sure yet how long I’ll keep it in there, so if you want it, hop on over and grab it! Lastly, I’ve also released a simple little feather necklace. It sounds silly, and you can’t see it very well in the ad, but I was pretty proud of the feather on it. I drew it all by hand from scratch, and having crap-all for artistic talent (though God knows I try and try), it was an accomplishment for me. I was so proud I was bragging about it to my husband the minute he walked in the door from work, haha. Anyway, here it is. Hope you like it! 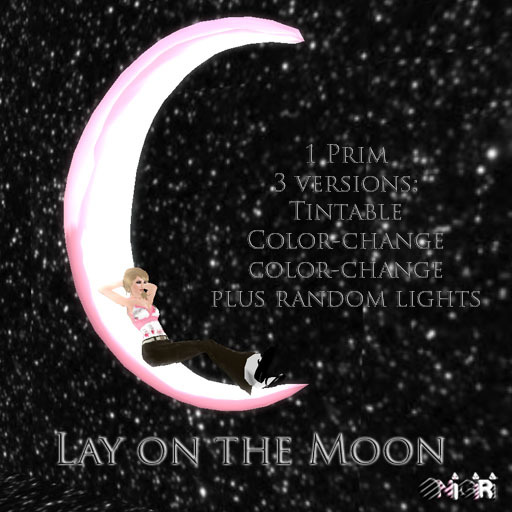 I know it’s been ages and ages since I’ve made anything – I had a bit of a hiatus from, if not SL entirely, the creative aspects thereof. Like a months-long writer’s block, except that it seemed like everything I tried to make with a plan came out looking horrible. I spent a lot of time holed up in my house sorting inventory. Up until the Vain Inc. valentine’s hunt, it was all nicely sorted! Anyway. There are a few new things up in the store, and if I’m lucky there’ll be more again soon, but I’m working on getting my Xstreet SL stuff up to speed first – I couldn’t believe it but there was stuff on there I hadn’t updated in almost 3 years. As I expected it would be, life has been really insanely busy lately. Long before we even got to house shopping, my husband and I decided we were going to get a puppy and a kitten when we get a place of our own (the apartments won’t let us have pets.) We both grew up with pets (or well, in my case, an entire menagerie – I’m a pet addict!) and I for one was going crazy without any furry bundles to cuddle with. We’ve been going to shelters and browsing online for pets for weeks now trying to find our perfect babies. The first cat we liked got adopted before we got there. Ditto the first dog we liked. But as was with the case with the house, having one thing get away from us just meant something even better was waiting. 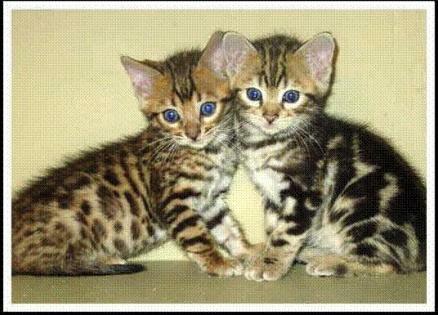 I’ve always wanted a bengal kitten, but they are typically anywhere from $500-$800 or more. My mother-in-law and I were both browsing online for bengals and she called at the exact moment I found a classified for 9 week old bengal kittens, $150 – she had seen the exact same ad! I told my husband there was no way they were still there; the ad was a day old and there were just the two. But, I said, it doesn’t hurt to call. So I called, and they had one left! “It’s the bigger of the two in the picture,” she said. I looked at the picture and said to myself, well, the one on the right is taller but the one on the left is longer. It’s probably the one on the left. I was a little bit disappointed because I prefer marbles over spotted, but decided I’d drive over and meet him anyway. As it turned out, it was the marbled one! Besides being smitten at first sight, he was an absolute sweetheart, and he settled down purring and snuggling in my hand; he even won over Thom, who isn’t as big on cats, purring and laying down in his lap when Thom found his “sweet spot” on the back of his neck. 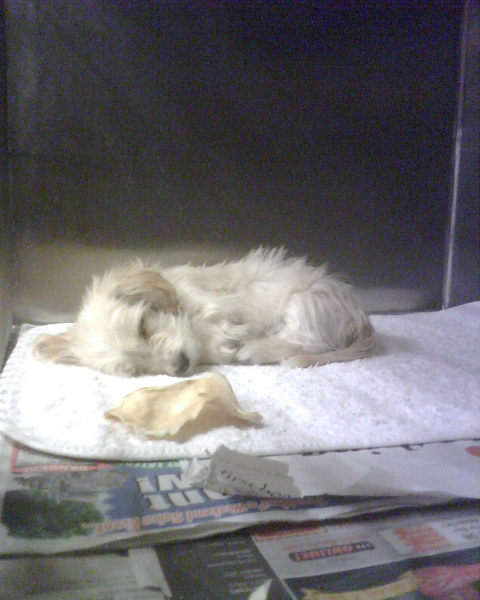 The very same day we found the ad for the cat, we’d been to the pound and found the absolutely most adorable puppy ever (the papers say cairn terrier/poodle, but she looks just like a Dandy Dinmont terrier to us), two months old. She was listed as a stray at the time so we had to wait four agonizing days for her to be claimed by her owner or put up for adoption. This morning she went up for adoption. We anxiously waited at opening time, hoping there wouldn’t be too much competition: if more than one person wants the same animal, they do a drawing for it, and every day when we visited her there were people fawning over her and asking when she was going up for adoption. As it turned out there were just three other people waiting for her this morning, and we got her! I couldn’t believe it. I started crying with happiness and excitement. We got to hold and snuggle her and she just licked us calmly and snuggled in our arms. Nobody could believe no one had come to claim her – or that the person who turned her in didn’t just keep her! We got both of our dream pets – we are so lucky! Here they are ^_^ We’ve named the kitten Kaizoku (means ‘pirate’ in Japanese – bengals are notorious thieves!) and the puppy is Penny! I wanted to save my new releases for a big grand opening of Onigiri’s new location, but real life has been constantly getting in the way. The good news is that we finally bought a house! The bad news is, we bought a house. It’s going to cost the absolute max we got approved for, so I no longer have the luxury of being a housewife and calling SL my “job” – I have to get out there in the “real” world and make some money or we’ll be uncomfortably tight. 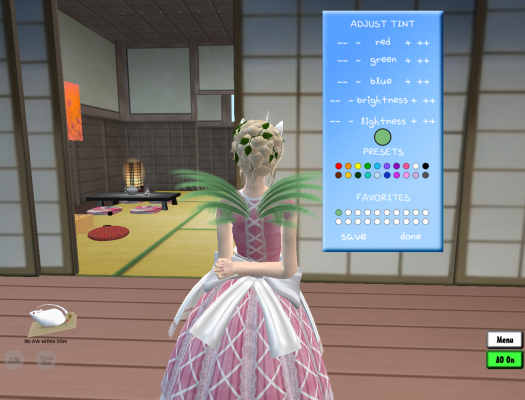 Because we were so busy between RL birthdays and visits and house hunting and all, I haven’t even had time to make much stuff in SL and the grand opening has gotten postponed a ridiculously long time already, so I’m just not going to do one. I’m just releasing these items as usual and announcing the location, and crossing my fingers. ^^ The new store’s going to look pretty empty for a while (the original plan was to fill it up before the grand opening!) but I wrote down my many many ideas so they’ll still get done, just not as soon as I’d hoped. I’ll be missing seeing as much of you all as I have these last couple of years. It’s been fun! The first release is a neko collar, scripted much the same as the cowbell choker (the neko collar came first, but the search for the bell sound inspired the cowbell choker. :D) ie. color change, bell sound + controls. The other release today is a treasure chest purse. Who doesn’t love all things pirate? I know I do!